What is Largo Residências and how did you build it up? Largo has various functions: it is a café, a hostel, a place for artist residencies; it is also promoting social and cultural events and trying to get people from the neighbourhood involved in the initiative. Largo started in 2011. At the time, we did not know much about whether we should be an association or a cooperative. We started as a cooperative because we wanted a structure that gives both cooperative investors and workers the same vote. In the first year we took part in a municipal program, called BIP/ZIP, that aims at kick-starting local projects. We also received some funding from private funders, who were members of the cooperative. We managed to integrate their money into the cooperative so we could start renovating the building. The square where the Largo is located was quite a problematic spot in the city because there were tensions between inhabitants, drug dealing and prostitution, and the renovation process of the square, that was going on at the time when we started the cooperative. We were quite afraid of being just another player within the gentrification process, so we focused on trying to get involved with the people who were there already. And that is the thing that also structured our identity not as an actor of the gentrification process, but as one trying to keep the networks of the local commerce, of the local shops, of the people who were living there but who were suffering, like all the Portuguese during the pressure of the crisis. In a certain way, we tried to integrate ourselves in the community from the beginning. What was your economic model for the renovation and maintenance of Largo? We started the renovation of the building without any money. Then we got 50,000 Euros from BIP/ZIP, which was not enough as the renovation of the building would cost 300,000 -350,000 Euros. Step by step we managed to inaugurate the hostel by opening up one floor and beginning to generate revenue – and we also had cooperant investors. It was very hard as the square was being renovated and nobody wanted to come inside, so the first years were very difficult. We used our skills in applying for social and cultural programs and we managed to get funding for our initiatives and could also keep some money for the building. We have two areas that are commercial: the hostel and the café. More and more they are supporting Largo’s activities. Last year we could produce enough money from the hostel and the café to support the cooperative. Something that is important to understand: the building of Largo is private, we pay commercial rent. As we have improved the building, we managed to negotiate over the rent, but not much. What is the impact of Largo on its surrounding neighbourhood? We see our work as a public project. For example, we employ 15 people from the neighbourhood, providing jobs, which are very valuable in Portugal these days. We run various projects, helping other associations in the neighbourhood getting through this bad financial phase. We rent spaces, we organise things around the neighbourhood, so to work as a network, supporting all these other spaces. For example, we have a list of spaces for people who are looking for artist residencies, so they can verify if the space is suitable for their projects. Besides the BIP/ZIP funding, how did your relationship with the Municipality evolve? Initially, we were neighbours of the Mayor, who had moved his office to this square in order to give visibility and public support to this sensible area: as neighbours, we could start building a relationship with the Municipality as they started understanding that our work was producing many positive effects on the neighbourhood. We think it is good to talk to the Municipality and see if they can recognise the work we do and if they want to take part in a triangle with the private sector, who owns the building, and us. Institutional support can help our actions to go beyond the idea of being temporary, low cost and being the product of the crisis. We are not. We are trying to do a long-term bottom-up process, a stable civic initiative. Pressure by tourism-driven real estate development has in the past year endangered many socio-cultural initiatives of the neighbourhood, including Largo. For details, see an article on Noticias Magazine. 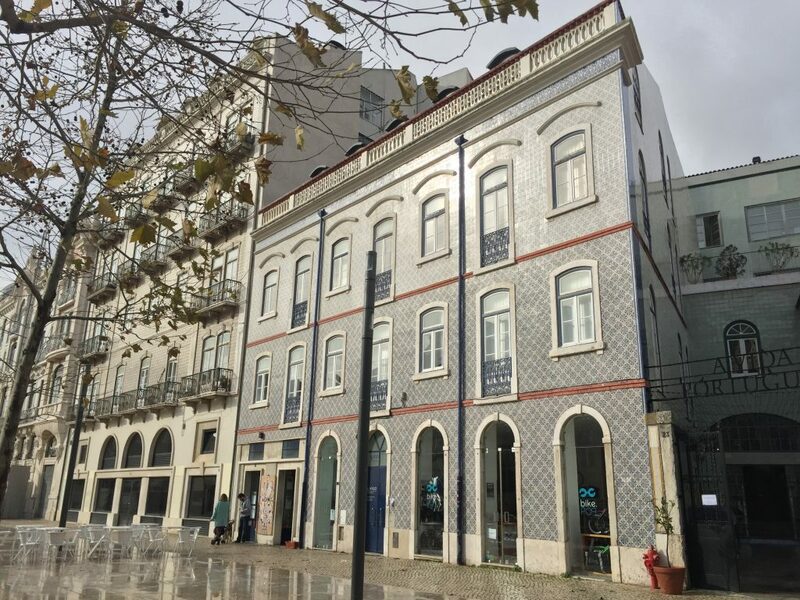 Community, Culture, Economy, Lisbon , Bip/Zip, community, cooperative, culture, English, Funding the Cooperative City, heritage, migration, public spaces, social inclusion, tourism, video, work.